Join the discussion on our forums! Come discuss Deranged Doctor over in our dedicated Deranged Doctor discussion topic. 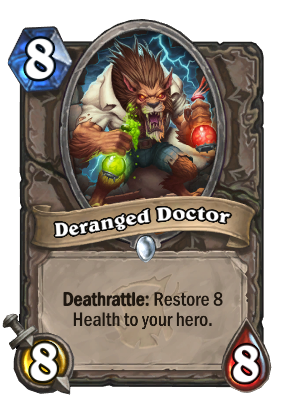 Deathrattle: Restore 8 Health to your hero. Unfortunately, his doctorate is in Murloc Literature. The red one tastes like cherry! The green one packs a punch! Semi-useful but hard to play. Not "Battlecry: Swap the Attack and Health of a minion"? Literally unplayable. Could've been pretty good if this was battlecry. I don't care about people's opinion, this is my favourite card from the expansion. Apologies for any confusion, this is indeed a Deathrattle effect, not a Battlecry! This is a top tier Arena pick, no doubt about it. The healing is extremely beneficial in Arena matches, and a juicy statline to boot makes him a fine replacement to both Faceless Behemoth and Eldritch Horror, two high-powered minions cycling out with the introduction of Witchwood.